One of the major themes of Streetsblog’s recent interview with Mayor Antonio Villaraigosa was the timeline for transit expansion. Rather than an outline of when projects would be completed, we sought to chronicle the policy switch from moving cars to a true pro-transit agenda. Was it when Villaraigosa was elected to the City Council and chaired the Transportation Committee? Was it when he first ran for mayor, when transit expansion was a major plank in his unsuccessful campaign? Was it in 2008, when the ability to fund a real transit expansion plan suddenly seemed possible? To hear Villaraigosa tell it, creating a working and integrated transit system was always something he dreamed about. But it won’t be his record on buses–one defended by Villaraigosa but excoriated by advocacy group the Bus Riders Union (BRU)–for which the mayor is remembered. It will be his ambitious rail and bus rapid transit expansion plans, and how those projects will change Los Angeles. 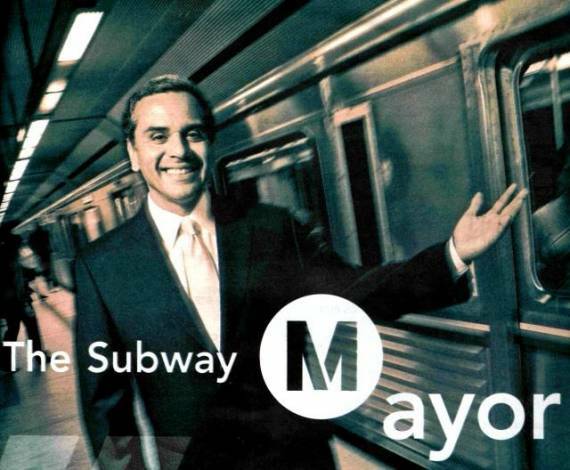 In 2005, the L.A. Weekly published “The Subway Mayor,” a piece profiling the long odds that Villaraigosa would face if he pursued his campaign promise of a “Subway to the Sea.” For a subway extension to occur, the mayor would need to get a federal law changed that banned subway construction in many parts of the Westside, defeat the BRU both politically and in the courtroom, find a major source of funding, and overcome resistance from Westsiders. While “The Subway Mayor” reads as generally supportive of increasing rail transit, it also makes the odds against such a proposal sound insurmountable. 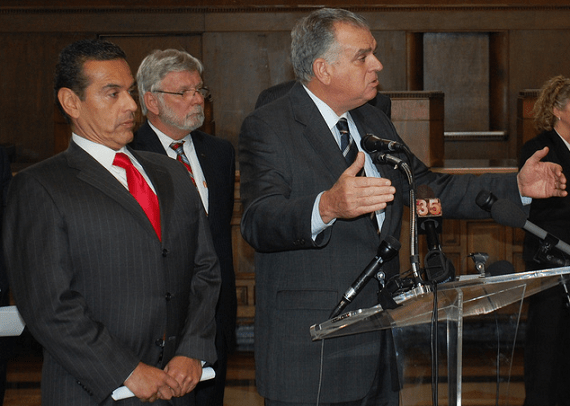 So far, Villaraigosa has run the table…and then some. While the mayor chaired the Metro Board of Directors from July 1, 2005 until June 30, 2006, the transportation projects were either “stalled” or “stale,” to use the terms from his interview preparation notes. The most exciting projects were stalled. The projects that were moving were stale. Villaraigosa ran on doubling Metro's rail transit when he ran for Mayor. To see the full presentation, including build outs for ten, twenty and thirty years down the road, click on the image. For most of that period, Metro was in transition. The agency was still operating under a ten-year federal consent decree signed in 1996 by the agency and the BRU to head off a civil rights lawsuit filed by the BRU. The decree required Metro to expand its bus service to such a degree that any dramatic increase in rail service was impossible. 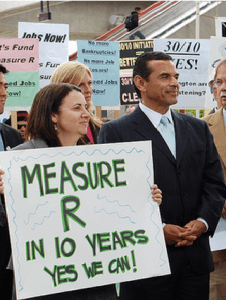 While the clock ran down on the consent decree, Villaraigosa began to lay the groundwork for the Measure R Campaign. “I knew we could never get anything passed on public transportation if we didn’t continue the fight on buses,” Villaraigosa remarked. At the same time, he pushed Congressman Henry Waxman at the federal level and Zev Yaroslavsky at the county level to change laws put in place that would stymie any attempt at the Westside Subway. Rather than attack either revered Westside politician, Villaraigosa appealed to their rational side. “The science has changed (since 1985),” he pleaded. In the end, he won the repeal of both a federal law banning subway construction through parts of the Westside and a county law banning certain funds from being used for subway construction. By the time Move L.A. and Denny Zane held the “It’s Time to Move L.A.” conference in January of 2008, the unofficial kickoff for the Measure R sales tax campaign, the discussion was already beginning to change. The consent decree was off the books and Metro was pushing large cuts to its bus service hours. At the same time, opposition to the sales tax proposal was already growing. As expected, the BRU fought the proposal, despite 20% of the sales tax going for transit operations. While many urbanists have praised Metro and Villaraigosa for the vision and strategy needed to create a real-life rail plan for the city, the BRU has stuck to their guns, criticizing Metro every time a new service cut for buses has been announced. Even as this interview is published, Streetsblog reporters are covering a BRU rally outside of City Hall calling for the restoration of bus service. “By the way, I wanted more money for operations but I couldn’t get the votes for it,” Villaraigosa argues. “I wanted to freeze the bus fares for everyone, but I couldn’t get the votes for it. Instead, Measure R held fares at their current level for five years and flatlined fares for seniors and lower-income riders for longer than that. There isn’t a public breakdown on how Measure R+, the shorthand for the plan to expand Measure R taxes for another 30 years, would impact fares. Doubling the transit system? Thanks in large part to Measure R, this is one campaign promise that was undoubtably kept. To see the full presentation, click on the image. Joining the Bus Riders Union in opposition was a coalition of public officials from the San Gabriel Valley, most vocally, County Supervisor Gloria Molina. “They didn’t understand it, so they were against it,” Villaraigosa remembers. Indeed, one of Streetsblog’s favorite pictures from the Measure R debate was a group of San Gabriel Valley politicians holding “anti-Measure R” signs that included one that read “Gold Line Now!” The construction of the Gold Line extension currently underway would not be possible if not for Measure R dollars. For Villaraigosa, the Measure R campaign was about more than building a transportation system for L.A. County. It was a referendum on the future of the city and on his mayorship. Measure R survived the legislative process, barely. Enabling legislation, based in part on a 2004 Senate Bill written by Culver City Democrat Kevin Murray, squeaked through Sacramento, passing each house by just one vote. Without the aggressive campaigning of Assemblyman Mike Feuer, Measure R might have died before it was even born. Similarly close votes were held by the Metro Board of Directors and the L.A. County Board of Supervisors. In the end, Measure R, a half-cent sales tax for all of L.A. County for the next thirty years, was placed on the ballot. It needed ⅔ support to pass. It ended up with 67.1% of the vote. “We got it passed; we changed the game,” the mayor celebrated. For Villaraigosa, the vote was more than just a sales tax. It was a matter of legacy. Despite his protestations that he doesn’t think about that sort of thing, Measure R allowed the man L.A. Weekly dubbed “the Subway Mayor” to actually advance a subway. Measure R made many of the mayor’s railway promises possible. Measure R funds twelve transit expansion projects, including: the recently completed Orange Line Bus Rapid Transit extension to Chatsworth; an extension of the Purple Line subway to the V.A. Hospital; a plan to connect the Green Line to LAX; and more. It also funds highway expansion projects, including a pair of controversial expansions of the I-710 and the High Desert Corridor in the Antelope Valley. The cover image from the September 15, 2005 L.A. Weekly Image:Ted Soqui/LA Weekly. Worse than the catcalls in the press, many of the same politicians and groups that opposed Measure R shifted their focus to opposing Metro’s 2009 Long Range Transportation Plan, a document needed before Metro could apply for federal funds for any project, regardless of Measure R.
Out of the need to get a divided Metro Board to approve the Long Range Transportation Plan came the 30/10 initiative, a plan to speed up the construction of thirty years’ worth of Measure R projects in ten years through government loans and bonds. Unfortunately, the plan required some pretty substantial changes to federal law. And just like that, “30/10” was born. “At first, nobody on the board was for this. Everyone thought we were nuts. ‘Are you freakin’ crazy? It’s an earmark!’” was what the mayor’s team was told. But after a year of meetings, both public and private, and a public relations campaign orchestrated with the Move L.A. Campaign, environmentalists and unions, Villaraigosa had the support of key leaders in Washington, D.C. With United States Transportation Secretary Ray LaHood and Senate Environment and Public Works Chair Barbara Boxer on board, getting support from reluctant Metro Board Members was easier than it was in the fall of 2009. While the politics of the Long Range Plan were debated, Villaraigosa and Move L.A. worked on refining the 30/10 plan. For all of the knocks the mayor’s taken on his public speaking over the years, his recall in this part of the interview is amazing. He brings up all these numbers from a debate that happened three of four years ago from memory. When Congress finally passed a transportation funding bill this year, it didn’t have all of Villaraigosa’s proposals, but the TIFIA loan program was increased to a billion dollars a year. Meanwhile, it took a year, but the Board of Directors passed Metro’s Long Range Plan, unanimously, in October of 2009. And when it came time to apply for federal funding, the projects at the top of the list were the Regional Connector and the Westside Subway. “As oppositional as everyone was to the subway and RC, we made those the two New Startsprojects because everyone knew they were the best projects in the federal formula.” New Starts is a federal grant program available to new projects in their early phases. In the president’s fiscal budget for this year, the Westside Subway receives a $75 million grant and the Regional Connector, one for $50 million. Unlike congestion pricing (see “Building a New Transportation System”), 30/10, or America Fast Forward (as it was re-branded in January of 2011), was popular with Democrats and Republicans alike. It also gave Villaraigosa, who was soon elected as president of the National Association of Mayors, a platform and issue to raise his own profile. Some argue that the Subway Mayor is more popular nationally than he is locally. But just because a plan has bipartisan support doesn’t mean it’s going to get passed. Especially in Washington, D.C. As bickering over the transportation bill, energy policy, oil pipelines, and greenhouse gases continued, the mayor and his allies began to work on an acceleration backup plan. 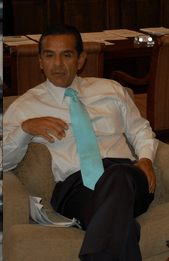 In June of 2011, when Streetsblog last interviewed Villaraigosa, we asked if there was a Plan B for America Fast Forward and if so, what was it? The mayor laughed at our question, replying that there’s always a Plan B. But he wouldn’t tell us what it was. His laughter makes a lot more sense now. Streetsblog had unknowingly used the same term, “Plan B” the mayor’s team used. We also know why he didn’t want to talk about the plan then. According to the mayor, he didn’t want “Plan B,” now known as Measure R+, to take away from the sense of urgency in Washington, D.C. It now looks like the mayor’s team might have played this perfectly. While they laid the groundwork for a campaign to extend Measure R at the ballot box and use the increased revenue to build transit faster, he also got a victory in Washington, D.C.
“Once we got [House Transportation Committee Chair John] Mica and everyone on board, it looked like TIFIA was going to happen,” the mayor supplied. Indeed, even as a first draft of Mica’s transportation bill was savaged for its strident partisanship, Villaraigosa publicly thanked Mica for including the TIFIA expansion provision, providing a little partisan cover for the embattled Congressman. When all the dust settled, the final transportation bill did include the TIFIA loan program, and Villaraigosa could thank Boxer and Mica and renew the effort locally to extend Measure R.
As Streetsblog has pointed out, there are a lot of hurdles facing the extension of Measure R. Some, including votes in the State Assembly and Metro Board of Directors, have already been passed. Others, including votes by the State Senate and L.A. County Board of Supervisors, still need to be crossed. And, of course, the Governor could blow the whole thing up by refusing to sign the needed enabling legislation. After all that, it still needs a ⅔ vote in November to become law. As for the Supervisors, he notes that even though they delayed a vote last week, it should come sooner rather than later. “The Supervisors, even if they’re not for it, they’re ministerial. They have to vote for it.” Three of the five Supervisors, Mike Antonovich, Don Knabe, and Mark Ridley-Thomas, voted against the plan to place the extension on the ballot at the Metro Board of Directors. In 2008, Knabe voted against placing the tax on the ballot at Metro, but for it at the Board of Supervisors. Apparently, Knabe believes the Supervisors’ role is ministerial as well. But all of this transit expansion isn’t just about providing people with transportation options, it’s about changing the way the city grows. From now on, the city has the opportunity to grow around transit projects and transit hubs. But, the future is going to be different, he promises. Right now, there’s a lot of opposition to the idea that L.A. will grow around its transit hubs. The much-ballyhooed Hollywood Plan that calls for just that is facing a trio of lawsuits. And, of course, the Westside Subway, Expo Line Phase II, and even the Expo Bike Path face challenges in the courts. For this article, Streetsblog has borrowed the term “the Subway Mayor” from a 2005 edition of L.A. Weekly. The article lists the daunting challenges Villaraigosa would face if he truly tackled changing L.A.’s infrastructure and car culture. For the past seven years, he’s faced catcalls and skeptics, including a number of articles here in Streetsblog. But, when compared to the picture painted in that 2005 article, things have changed dramatically. Even former aide and former Mayoral Candidate Austin Beutner scoffed when asked about America Fast Forward by a Streetsblog reporter last year. When asked if he feels any vindication, Villaraigosa demurred and pointed to the hard work of his staff, especially Borja Leon, Metro Board Member Richard Katz, and LADOT General Manager Jaime de la Vega. Villaraigosa promises that he doesn't measure the curtains when visiting with USDOT Secretary Ray LaHood. Was he hinting that he might be sitting at a different desk in Washington, D.C. next year at this time? Villaraigosa brushed that one off with a hand motion. Regardless, Streetsblog will check in with Mayor Villaraigosa for another sit-down interview next summer, after he’s termed out of office. Whether that interview will be conducted by Damien Newton (in Los Angeles) or Tanya Snyder (in the Capital) remains to be seen. the grit and creativity to get the current slate of Metro projects done. As a person who does not drive. It is very difficult for me to understand. We pour so much money on the public transportation. Most of car drivers agree that Measure R is terrible. It only address one side of equation, train. Let’s not forget, the bus cut as a result of Measure R.
Most transit friendly cities don’t have bus riders VS rail rider issues. Many people take rail drive cars to train stations. They will not take train unless the station is outside the destination. Many car drivers who love to use the public transportation ask me why is LA building rail when it is bus system is so terrible. Everyone love trains, but train cost too much money. If building train siphons away the budget to improve the bus serve. I was neutral on Villaraigosa until 2008. Streetblog makes me wander if promotes more driving or public transportation. In case, the writers are so ignorant, go to London and Paris, and see how people get to rail stations. How about a City Hall/Villaraigosa station on the Regional Connector? The one at 2nd and Main? Busses get 20%. Our busses are relatively new, the Orange Line was just expanded, and fares have been kept low, especially compared to other cities. No one is ever happy with the bus system. The riders weren’t exactly in love with it during the Consent Decree when money was being dumped into them. You could live in San Bernardino/Riverside or Orange County as a comparison where there is little service. Finally, most people do not drive to rail and then board. Why would you think this as it is completely offbase. For example, Expo has roughly 20,000 boardings, but there are all of 1,000 parking spots. The Red/Purple Line has 160k boardings and at most 2,000 spaces. The Blue Line over 80k riders and again very few parking spaces. 1. Sales tax revenues have dropped. 2. State transportation funds have been cut. 3. The federal government refused until recently to allow federal funding for operations. 4. Ridership has dropped as people lost their jobs (no longer commuting) and the price of oil dropped. The 20% of Measure R funds dedicated to bus service ensured that cuts were not as deep as in other regions, plus Metro has kept its fares lower than other regions. That said, there is a valid criticism that Metro has cut too much bus service. However, instead of pitching this as a bus vs. rail conflict, keep in mind that Metro also spends a lot of money on highways. It was a huge boost to the economy for the federal government to put people to work doing construction during the depression in the 1930’s and pushing these transit projects along will get similar results in the county. Another brilliant idea that Mayor Villaraigosa proposed last November was to borrow $800 million against future local Measure R returns to repair some of the streets over a period of 2-3 years. Almost one sixth of Los Angeles streets are in a failed state and it would take about $2 billion of repairs over 10 years to bring the streets up to a average B condition. Perhaps if Measure R+ passes both the streets can be repaired and the $1 billion of needed repairs to the sidewalks can be made. Folks, this is what real leadership looks like. Snipe away all you want: getting things done like Mayor V has accomplished is HARD. It’s so easy to be a Monday morning quarterback, and so very, very hard to build something for the future when everyone has a million reasons to not do it, or why some little detail of the plan isn’t to their liking, or whatever. The Mayor will be remembered as a transformational figure in LA history. Metro should name the Rodeo station after Villaraigosa. A daily reminder to the NIMBYs in Beverly Hills. Another brilliant idea that Mayor Villaraigosa proposed last November was to borrow $800 million against future local Measure R returns to repair some of the streets over a period of 2-3 years. Almost one sixth of Los Angeles streets are in a failed state and it would take about $2 billion of repairs over 10 years to bring the streets up to a average B condition. Perhaps if Measure R+ passes both the streets can be repaired and the $1 billion of needed repairs to the sidewalks can be made. ————–We did talk about this, but not in a ton of depth. I’m going to try and format the audio over the weekend so that we can post that next week. I will say he pushed the idea that with a recession, we should invest in long-term infrastructure bonding. Even though we’re bonding for jobs that won’t be there in 20 years, the infrastructure will be. The Los Angeles Bureau of Street Services produced a assesment of the condition of the streets report in 2008 that stated there are 1,000 miles of roads in a failed state due to inadequate amounts of money devoted to maintaining them over the years. According to the report, it takes 5-7 times more money to rehabilitate a road that has reached the failed state. So, even though the interest would be almost as much as the amount borrowed and it would use up future money, it would still be cheaper in the long run to repair as many streets as you can in a much shorter period of time borrowing against the future local Measure R funds.. That is the brilliance of the idea that the mayor came up with. Plus, it will both put more people to work during this recession and it will speed up the implementation of the bike plan by having freshly paved streets to easily put in bike lanes in conjunction with the vehicle lane striping. Mayor V has done a tremendous job with transportation here in LA and helped get funding for transit nationally. Just remember what we had when Mayor V came into office and what we will have on his departure. We all have a lot to thank Mayor V for. He will be remembered for many years as our transit mayor who got things done. We need just one more impotent job for our mayor before he leaves office. Please put pressure on LA-DOT to allow signal preemption on the new Expo Line and the East LA Gold Line to allow for faster service. There has been some improvement along Washington for the Blue Line so it can be done. After all a train with close to a thousand riders should be able to go ahead of say 50 cars with maybe 150 people for only about 30 to 40 seconds. After all aren’t we trying to move people rather than cars?